If the goal is to create organisations where every leader is someone others are genuinely eager to follow, then let’s create great leaders of our senior managers, so they can build high performing organisations when they become Chief Executives, attracting and developing leadership talent in a sustainable way. The step-up from senior manager to Chief Executive is a significant change from being responsible for a department to leading an organisation. The personal attributes, knowledge and skills required to be an effective Chief Executive and develop a high performance organisation are unique and there is an increased isolation and autonomy that many find challenging. Appointing a first-time Chief Executive is also a business risk for Board of Directors, who need to put their faith in a person who does not have a relevant track record to lead the organisation and protect shareholder value. Similarly, promoting an internal senior management candidate to fill the shoes of an outgoing Chief Executive carries the same risk, if not more so, as they need to change internal perceptions and existing relationships in order to take the helm competently and make the tough calls. First-time Chief Executives need to be able to handle the fast-paced environment that requires effective judgement, self-control and discipline, effective leadership and the skills to keep the business moving forward without becoming distracted by the day-to-day operational demands and fire-fighting. They also need the confidence to pursue what they feel is the right direction. Literature that discusses the focus of new Chief Executives in their first 100 days of a new CEO includes undertaking a systematic, initial assessment of their organisation. However, most first-time Chief Executives will not have experience of a high performing company against which to benchmark. Being a first-time Chief Executive can be challenging, yet rewarding if you are prepared with the right mindset, skills, a roadmap that focuses you in the first year and an experienced mentor to coach you through the challenging times. 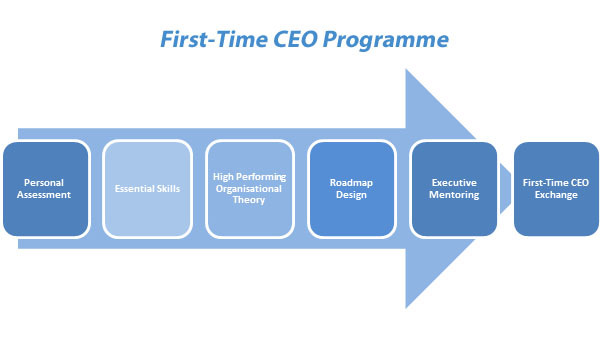 First-Time CEO is a development programme that bridges the gap from senior manager to Chief Executive and overcomes this initial period of risk and uncertainty. The programme equips the first-time Chief Executive with the skills and resources they need to be successful in their new role and to go on to develop a high performing organisation by applying established business theory in a structured way that delivers results. The programme can also be used as a development plan in succession planning for internal Chief Executive candidates, which will deliver immediate benefits to the organisation. For an organisation that is already high performing, the programme will equip senior managers with the knowledge and skills that they need to continually improve and reinforce critical strategies in their existing position. First-Time CEO is a natural progression from a Master of Business Administration (MBA) programme and leads into a Board of Director’s course, which equips a Chief Executive to become a first-time Board Member. Personal Assessment - A series of individual assessments to provide candidates with a benchmark against the personal attributes, beliefs, skills and knowledge of high performing Chief Executives. This gives them a starting point for development and the basis for Executive Mentoring. This reflection and learning activity is an essential precursor to developing Essential Skills. Essential Skills - The programme provides candidates with critical, but often over-looked strategies, techniques and tools in: time management, change management, coaching and mentoring, reflection and self-development, networking and effective relationship management. 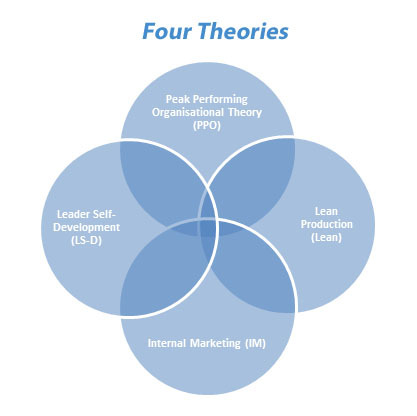 High Performing Organisational Theory - Detailed review of four organisational theories that together provide philosophy, framework and tools to develop a high performing organisation by getting the basics right across the board. Roadmap Design - A high level process and benchmarking criteria for assessing an organisation against high performance criteria. The Roadmap will provide direction, purpose and perspective in their first year as a Chief Executive, even when operational demands increase. Executive Mentoring - A formal mentoring programme between the candidate and an experienced Chief Executive that lasts for one year, providing guidance for developing their skills, attributes and implementing the Roadmap. Executive Mentoring can be adapted for those candidates who are participating in this programme as part of leadership development and succession planning in their organisation. First-Time CEO Exchange - A professional network that links with previous classes to leverage experience, promote discussion and learning, and to form valuable peer relationships. Quarterly events are held as well as continuous discussion on best practice in an online environment that also provides members with research, information and tools to assist them in their role as Chief Executive. The four theories are proposed for forming the basis of high performing organisations, with synergies between each (see appendix in attachment). Rather than focusing on the functional departments of an organisation, the First-Time CEO programme will focus candidates on how to transform key organisational processes to build a sustainable foundation for a high performing organisation. Although developing organisational processes so the organisation is supported to become high performing, which cultivates employee talent and self-developing leaders, is not new, the concept that this hack puts forward is to make sure that first-time Chief Executives are established well the first time, with the right knowledge and support to be successful in developing high performing companies themselves. If they've never been part of a high performing company, how will they know how to create one? On a large scale, this could have a profound effect on the performance of our Chief Executives and their employees, our organisations and ultimately our economies. 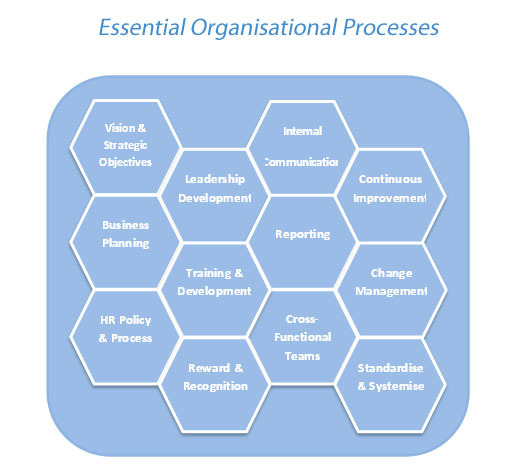 Are equipped to assess their organisation against a benchmark for high performance across essential organisational processes. Have a clear, strategic roadmap, tools and experienced mentor to guide them in transforming their organisation for high performance in a managed way. Have the skills to manage their time with competing demands, maintain a strategic perspective, reflect and self-develop their leadership skills, and apply their mentoring skills to lead and develop employees. They attract the right, self-developing people to their organisation who are supported by business process to become leaders and operate at peak performance. An effective and challenging professional development programme for senior management succession planning, development of senior managers in high performing organisations and essential third-party support and professional networks to manage the initial risk associated with a first-time Chief Executive appointment. Growing the leadership talent pool in a way that not only develops high performing Chief Executives, but in turn they create a business environment that attracts and continuously develops employee talent and creates future leaders. Transform New Zealand’s economy through high performing, dynamic, innovative and effective leaders and their organisations; engender a continuous transfer of best practice knowledge. Consult widely with key stakeholders (Boards of Directors, Chief Executives, Senior Managers, MBA programme directors and Institute of Directors) to confirm the need for, and the components of, the First-Time CEO programme. Identify a suitable champion to manage and deliver the First-Time CEO programme; include Universities who deliver the Master of Business Administration programme. Review and evaluate the four theories against other theories on high performing organisations to ensure best practice is used in this programme. Research effective mentoring programmes and identify critical success factors. Identify and train experienced Chief Executives as mentors. Research effective professional networking groups and identify critical success factors, including face-to-face and e-networking infrastructure. Create a working group to finalise the First-Time CEO programme design, materials, trainers and relationships. Develop branding that positions the programme as the premium experience for first-time Chief Executives. Confirm target audience attributes and develop marketing channels and a marketing campaign. Run a pilot: Targeting the top 100 companies in New Zealand, in order of priority, to fill the pilot programme; the pilot is likely to be filled with senior managers whose Chief Executives and Board of Directors see value in developing them for succession as internal candidates for the Chief Executive position. Evaluate and improve the programme. Establish an ongoing First-Time CEO programme. My experience as an employee at Meridian Energy (1999-2004) is the single greatest contributor to the thinking behind this hack. I wondered 'What process would I follow to replicate the dynamic, high performing and leader self-developing culture that I experienced at Meridian?". Reichard, R. J., & Johnson, S. K. (2011). Leader self-development as organizational strategy. The Leadership Quarterly, 22(1), 33-42. Various Internal Marketing materials, listed in the attachment: ‘Report - Internal Marketing’. Other materials that I have read in relation to this hack are attached. Also, thanks to Bernie Frey, Massey University (NZ) MBA lecturer for introducing our class to the Management Exchange. I like this. I really like the comments about looking at business processes rather than the more traditional functional bounded aspects of running a business. If and when the time is right for me, this is a course I would really appreciate. Thank you for your comments. I think an organisational process focus enables you to maintain a focus on getting the order to the customer in the most efficient and effective way, whether that is product or service to your client or resources/information to your internal customer - the employee. Building great processes also becomes self-sustaining, surpassing movement of staff in and out of the organisation (ie it becomes part of the organisation's structure and spirit). Feel free to share your ideas on any additions you think would improve this idea. This is an EXCELLENT idea. I accepted an internal move to CEO when the founder sold the company and retired. We were now a wholly owned subsidiary of a a publicly-traded, foreign owned firm and I need to drive change. I was GREEN. Moreover, i had some very odd internal dynamics to deal with....a colleague who was unhappy about my promotion.....and decided that sabotage was the way to go. Though we ended up delivering record results and evolving the culture.....it wasn't easy. This course would have been extremely valuable in helping me build skills, confidence, and a stronger leadership team....faster. Hi Gaye and thank you for sharing your experience, it sounded like it was a difficult time. Great work on making the leap, taking on the challenges and producing great results. Do you have any suggestions for (a) what you think is particularly valuable about the proposed First-Time CEO programme and (b) suggestions for improving the First-Time CEO programme that I have proposed, based on your own experience? I like the concept, I also would fit in to this gap between senior management & CEO on know the challenges moving up to my first GM or CEO role. I would sign up for the course! Thanks for comments, Nigel. Maybe someone will run with the idea and make it a whole lot easier to make that leap. Nice, and seems very fresh.